Most of the long-range modeling is agreeing on a weak El Nino developing for late fall. The current La Nina is almost finished and neutral conditions will be the key to hurricane season this year. 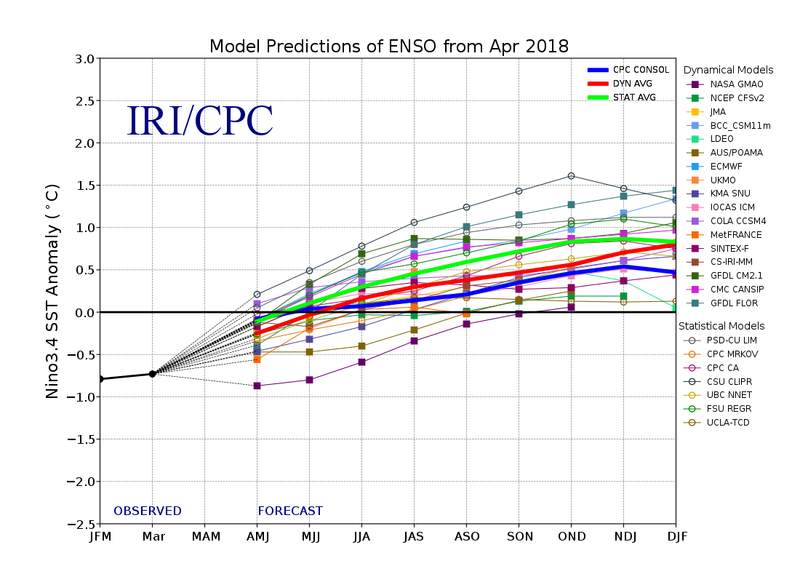 See the chart below for forecasted conditions of the ENSO for this upcoming year into early 2019. I am expecting a near normal too slightly above normal hurricane season. The limiting factor could be the African dust that keeps storms from organizing too quickly. The trade winds will also be a little stronger, especially earlier in the season. Those on the Eastern Seaboard will need to watch closely this season. I believe we will have more in-close storms than the last several years due to the active Gulf Stream. Those with property and interests along the Carolina and Georgia Coasts need to pay particular attention this year. The chart below is from Weather Research Center and shows where they expect the greatest risk to lives and property this hurricane season. I am in complete agreement with this forecast in regards to risk percentage. Be sure to have an evacuation plan already in order should your area see a direct hit. I believe the threat of a direct hit on the Carolina or Georgia Coasts is very high this coming season, especially later in the hurricane season. 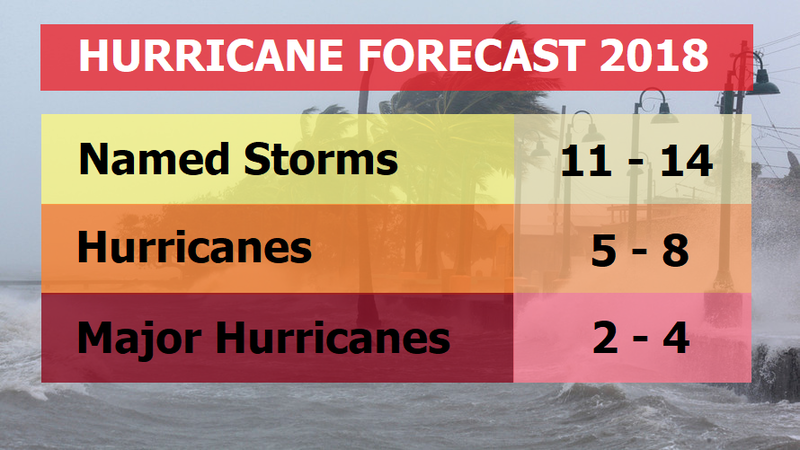 We always put out an outlook to show you what we are predicting as far as the number of storms. We have included this chart below and hope it is wrong but conditions are very favorable for a direct hit this upcoming hurricane season. We can only hope and pray this is wrong and does not happen. God can change things in a heartbeat and I hope this forecast is wrong but I not liking the way things are looking so far. This is one forecast that I would love to be wrong about. 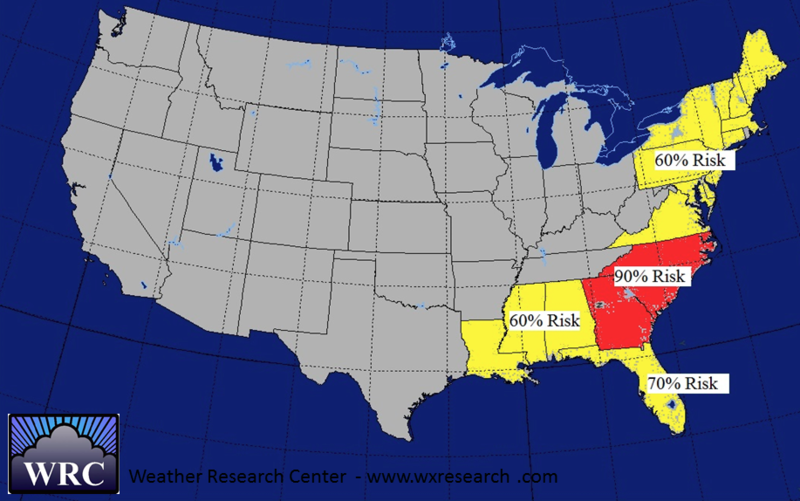 Southeast Weather is a weather consulting firm that specializes in advance warning of high impact weather events year round. We think that you will love the services provided and look forward to“Preparing You For The Weather”.